Soooo many options that speak to children this week!!!! This is probably the longest post ever. There are three natural storms that awe Job, panic the disciples in a boat, and overtake those who go down to the sea in ships in Psalm 107. In both northern and southern hemispheres late June can be a stormy time. So, it is easy for everyone to get into the fear of the storms. Set the stage with a stormy, dissonant musical prelude. If they are familiar in your area, add a storm siren. Hang the storm flags used in coastal regions. If you taped red streamers to electric box fans on Pentecost, tape dark blue, gray and black streamers to remind of the storms. Begin worship with a call to worship that names God’s power and our fears. Adults immediately make the mental jump from natural storms to stormy fights with friends, problems in families, wars between countries, illnesses that upend our lives and the lives of all around us, etc. Children need help. Early in the service tell them specifically about these other kinds of storms. Show pictures of a variety of storms asking “What is the storm here?” “How does it feel to be in this storm?” Then encourage them to listen for the storms in worship today and for suggestions about how we face all kinds of storms. The common element in all these storms is our fear of their power. None of these stories deny the power of the storms. The storms are there and are real threats. But, each one insists that God is with us in all the storms. Children are often told not to be afraid. These passages, on the other hand, say that fear is the appropriate response, but that fear doesn’t need to overpower us. Jesus/God is with us. Give worshipers gray paper and black pencils with which to draw pictures of what they fear while they talk to God about those things or to write prayers about their fears. Invite them to drop their prayer sheets into the offering plate or collect them in baskets that can be placed on the central table and be prayed over by the whole congregation. F The story in the Bible is long, but everyone might enjoy hearing the whole thing read from the Bible. Children especially enjoy hearing a story they probably know read in church from the big Bible. BTW I couldn’t find a version of this story in a children’s Bible storybook that I particularly like. If someone else has one, speak up! F To make it more dramatic, have it read by three males – a deep-voiced big Goliath, a 10-12 year old David, and one of the usual liturgists. They stand in the front each carrying their script in a choir folder to read. It will be smoothest with either lapel mikes or three separate mikes. Try this script. Israelite Reader: When Saul and all Israel heard these words of the Philistine, they were dismayed and greatly afraid…. David Reader: David rose early in the morning, left the sheep with a keeper, took the provisions, and went as Jesse had commanded him. He came to the encampment as the army was going forth to the battle line, shouting the war cry. Israel and the Philistines drew up for battle, army against army. David left the things in charge of the keeper of the baggage, ran to the ranks, and went and greeted his brothers. As he talked with them, the champion, the Philistine of Gath, Goliath by name, came up out of the ranks of the Philistines, and spoke the same words as before. And David heard him. Israelite Reader: So Saul said to David, “Go, and may the Lord be with you!” Saul clothed David with his armor; he put a bronze helmet on his head and clothed him with a coat of mail. David strapped Saul’s sword over the armor, and he tried in vain to walk, for he was not used to them. David Reader: Then David said to Saul, “I cannot walk with these; for I am not used to them.” So David removed them. Then he took his staff in his hand, and chose five smooth stones from the wadi, and put them in his shepherd’s bag, in the pouch; his sling was in his hand, and he drew near to the Philistine. David Reader: David ran quickly toward the battle line to meet the Philistine. David put his hand in his bag, took out a stone, slung it, and struck the Philistine on his forehead; the stone sank into his forehead, and he fell face down on the ground. 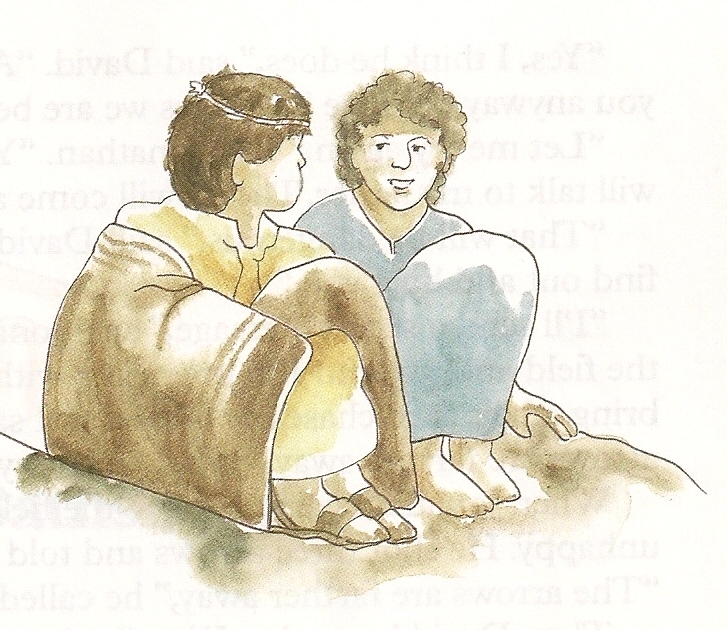 F Have a group of children retell the story by singing “Only A Boy Named David” with the motions. F The challenge is to get worshipers of all ages past the way this story is used in our culture to say that the little guy can beat the big guy to the biblical message that God’s power is stronger than the power of humans – even giants. Unpack this by paying careful attention to the war of words that precedes the physical battle. What does Goliath say? What is his power? Then, What does David say? Note that David does not say “I come to you with the perfect aim of my deadly slingshot” but “I come to you in the name of the Lord Almighty.” Reread the rest of David’s speech taking time to highlight his reason for getting into this fight and who he thinks is going to be the winning power. F Compare David with the other Israelite soldiers. The other soldiers facing Goliath said “I’m scared” and “I can’t (because I am scared).” David said, "who does that giant think he is dissing God? God can use me and my trusty slingshot to teach him a lesson." Then, identify times when we all say “I’m scared” or “I can’t (because I am scared)” and challenge worshipers to follow David’s example. F If you are uncomfortable with David’s use of violence to settle the score with Goliath, take a look at “How to Train Your Dragon” (2010 animated movie). 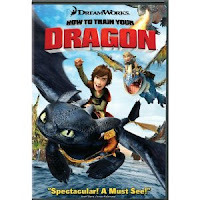 In it Hiccup, the puny son of the Viking chief Stoik the Vast, conquers an injured dragon by befriending it. (There is a clip in which Hiccup tells his friend Astrid that when he looked into the eyes of the dragon, he saw someone just like himself and realized that the dragon was afraid too.) In return for Hiccup's making him a new tail, the dragon becomes Hiccup’s partner. Together they save the village and replace the animosity between dragons and Vikings with friendship. The problem with this is that it strays from the Bible’s insistence that God rather than human physical or mental powers wins the day. 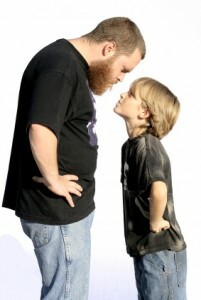 But it does parallel the small guy winning – and without resorting to violence. 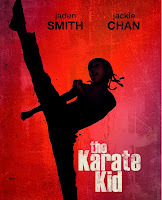 F Another movie that connects to this story is “The Karate Kid.” David perfected his slingshot skills doing the mostly dull, boring job of taking care of the family sheep. In the 1984 Karate Kid, the kid builds his muscles and responses by sanding and repainting a very long wooden fence and repeatedly polishing an old car. In the 2010 version he must repeatedly pick his jacket up from the floor and hang it on a hook. In both versions the Kid hated the job and did not understand until later how it prepared him for his Karate match. This is a psalm David might have prayed while taking care of his sheep (and so perfecting the skill of trusting God) and while walking toward Goliath. It is an acrostic and makes most sense in that format. So, have it read by a series of readers of all ages with each reader stating their letter before reading that section. Readers stand in a line at the front of the sanctuary. Zain Sing praises to the Lord, who dwells in Zion. Declare his deeds among the peoples. Het Be gracious to me, O Lord. in the net that they hid has their own foot been caught. the wicked are snared in the work of their own hands. nor the hope of the poor perish forever. let the nations know that they are only human. F I suspect that this text is offered as an alternate for those who do not want to read David and Goliath in worship. But it’s presence here led me to look at the upcoming David stories. And, that led me to ponder which David stories have been included in the lectionary and which have been omitted. I think I’d do some rearranging. In Proper 8 David mourns Saul and Jonathan. I’d consider reading all or part of Samuel 17 - 18:5,10-16 about the difficult relationships between David, Saul and Jonathon as back story and focusing on the difficulties of friendships. Knowing this story makes David’s mourning his best friend and the King he loved, but who hated him, make sense and feel even sadder. I’d also consider omitting the Proper 9 story of David being crowned in favor of one of the omitted stories below simply because the omitted stories offer stronger themes. 1 Samuel 24 – David spares Saul’s life and cuts off a corner of Saul’s robe when Saul stops to go to potty in a cave unaware that David is hiding in the cave. 1 Samuel 26 – David spares Saul’s life again, this time taking the spear beside him when David found him asleep. I’d use either chapter 24 or 26. 1 Samuel 25 – Abigail negotiates peace between David and her husband – a wonderful, strong story about a woman who was a peacemaker. Go to Year B - Second Sunday of Easter for ideas about using this psalm in worship. Today it celebrates the friendship of Saul and Jonathan (especially in the face of the problems presented by Saul’s hatred of David) and the harmony Paul seeks, but sometimes does not find, in the church at Corinth. The fact that such friendships are not easily formed or kept makes them even more precious. To understand God’s message from the whirlwind, one needs to hear the whole story of Job. This fall Propers 23,24, and 25 include Job texts. It might be better to save Job for then. Psalm 107 is a road song. Pilgrims climbing the steep, hot road up to Jerusalem to worship at the Temple, would recite it as they walked in groups, rather like some of the songs families sing in cars as they travel today (think “Banana-nana-bo bana”). It has a clear pattern of verses describing the trouble some people faced and were saved from by God and a chorus calling on them to “thank the Lord” for their deliverance. Today’s “verse” describes the problems that befall those who go down to the sea in ships – like Jesus and his disciples in Mark. It turns into a responsive congregational reading. Before reading it, tell worshipers to imagine themselves in a crowd singing on the hot, steep road to Jerusalem. For maximum effect have the whole congregation stand and walk in place as they read the psalm together. whose steadfast love endures forever. for these wonderful works to humankind. F This complex text is mainly for the adults. One message to share from it with children is Paul’s account (vss. 3-7) of how he stuck with his job no matter how hard it got. Read from the Contemporary English Version with lots of dramatic inflection. Stop after each set of 3 difficulties to detail them with brief specifics from Paul’s life. If you have read the gospel storm at sea, be sure to refer to Paul’s being shipwrecked at sea. ﻿3﻿ We don’t want anyone to find fault with our work, and so we try hard not to cause problems. ﻿4﻿ But in everything and in every way we show that we truly are God’s servants. We have always been patient, though we have had a lot of trouble, suffering, and hard times. ﻿5﻿ We have been beaten, put in jail, and hurt in riots. We have worked hard and have gone without sleep or food. ﻿6﻿ But we have kept ourselves pure and have been understanding, patient, and kind. The Holy Spirit has been with us, and our love has been real. ﻿7﻿ We have spoken the truth, and God’s power has worked in us. In all our struggles we have said and done only what is right. 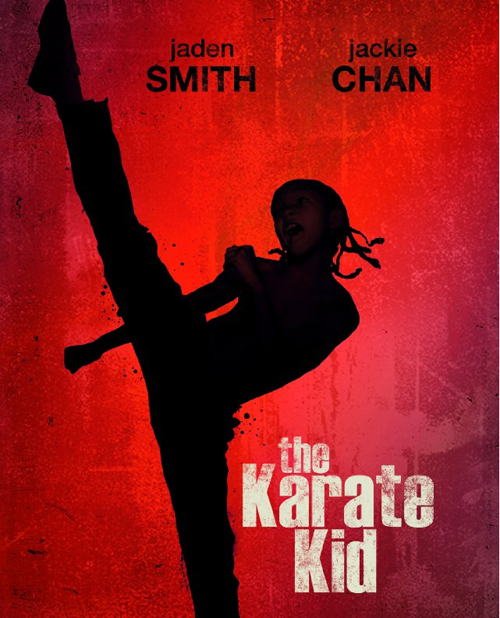 F The Karate Kid that connects to David’s story could also be used as a parallel to Paul’s perseverance in his mission. Like Paul, the Kid stuck with his teacher's assigned task even when he did not want to do it. During the current run up to the Olympics children hear plenty about athletes following their disciplines. Paul insists that there are other areas in which we are called to stick with it - even when it gets hard. F Imagine how Jesus’ voice sounded when told the wind and waves to be still. Did he say it loudly and forcefully or gently as if calming a puppy? Was he irritated with the storm - or with the fearful disciples? Try saying it several ways. Invite worshipers to read it as they think Jesus said/meant it. from Art in the Christian Tradition, a project of the Vanderbilt Divinity Library, Nashville, TN. http://diglib.library.vanderbilt.edu/act-imagelink.pl?RC=48068 [retrieved May 24, 2012]. 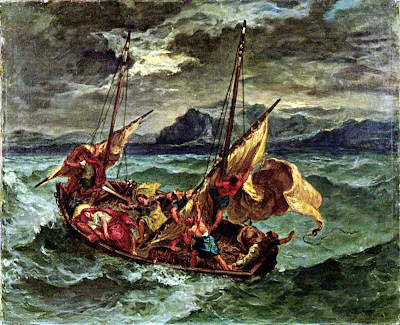 F This painting of the storm at sea comes from the Vanderbilt Art library. There are several others just as wonderful in different ways. Show this or one of the others. Talk about storms and how it feels to be caught in the storm. Point to Jesus asleep in the boat and ask how the disciples felt when they were so scared and Jesus was sleeping. Then read Mark’s account of what happened. Older children can compare the difference in the disciples’ fear of the storm and fear of how Jesus calmed it. F Sing “Eternal Father Strong to Save.” In the USA point out that it is the Navy Hymn. Before singing it work through the phrases of verse 2 connecting them to the gospel story. Also, point out the final line of the first three verses. Have the congregation say it together. Identify groups of people who live on the sea today. Then sing the hymn. F See other suggestions about fear in the face of storms at the beginning of this post. Thanks for the ideas and the reading. I'm going to have the man reading the Goliath part stand on a stool. This is my first time on your website, and it is wonderful! We have done Children's Time (not sermon, but a discussion with children, surrounded by the congregation) for five years now, and some of your ideas are coming to children's time tomorrow. Thank you!